If you haven’t started writing a food truck business plan yet, we explain the importance of it and why you need to start one today. Have you ever thought that starting a food truck business or other variation of a mobile food eatery? Whether you are already culinary trained or a home based foodie who is interested in taking their show on the road, there are a few things to consider before taking the time, money or effort to begin your adventure. For those looking for food trucks for sale, a common question we receive is how to attain capital for starting a food truck business. In today’s economy, many have drained their savings accounts, and maxed out their personal credit lines. Because of this they need to reach out to others to get this money. The solution lies in coming up with a well thought out and professional food truck business plan that can be submitted when they apply for loans. Unfortunately, many people have never learned how to write a proper business plan and immediately look to the Internet to search for a food truck business plan sample or template they can purchase. In our opinion, this is the wrong solution. There are certain points that financiers will look at when reviewing you loan application which will include a food truck business plan. Too many of the available templates just don’t cover them. When you sit down to start writing your plan, you must remember that it is your argument to show your idea is worth backing. Those that use the excuse that they cannot write a food truck business plan are the same people who have never thought out all of the aspects of starting a food truck business. In other cases they may have thought out the business aspects, but have not taken the time to understand what holes exist in them. What problem or problems exist that your business is trying to solve? What is the potential consumer’s pain? How deep and compelling is this pain? What solutions does your business have to resolve the problem(s)? What will the customer pay you to solve this problem? How will solving this problem make your company a lot of money? What alliances or relationships can you leverage with other companies to help yours? How big can your business growth if given the requested capital? How will the skills of your business team, their business knowledge, and track record of execution make this happen? What will be the investors’ exit strategy? One additional word of advice; once you have written your food truck business plan but before you pass it on to a lender, do as our earlier example did, have it reviewed and read by a friend or relative. After they have read it, have them give you a verbal explanation as to how they think your new business will work, based on your plan. If they do not understand the plan or cannot explain the business concept from what you have provided, there is a very good chance that a financier will not understand the business concepts either. If they have questions, incorporate the answers into the plan or clarify an answer so that the question is automatically resolved when the financier reads it. In most cases, this is a business that you know about. This becomes another stumbling block people will run into. They write their business plan so that it is self-explanatory, but leave it at that. The business plan you write for your future food truck, cart of catering venture must make sense to those who are reading it, and most of them, know nothing about our industry. We hope this article was helpful for those of you who maybe thing about starting a food truck business. 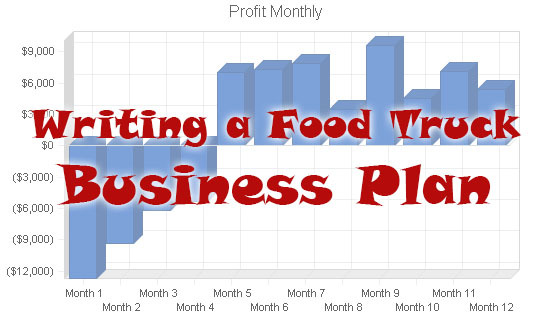 Still have questions about writing a food truck business plan? 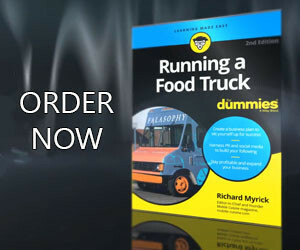 You can find a full breakdown of each food truck business plan section in my book, Running a Food Truck for Dummies. If you’ve read the book and still have questions please feel free to submit a question in the comment section below.